This is a 9″ recurved survival knife. The handle is Presentation Grade Stabilized Yellow Cedar Burl. The bolsters and liners are Double Black G-10, and the pins are 1/4″ Black Canvas Micarta and 3/8″ thong tube. The steel is S30V – the best kind – with a Rockwell hardness of 60 for optimum edge holding, corrosion resistance, and toughness. The sheath is made of 9/10 ounce top quality leather, hand-dyed, hand-hammered and hand-stitched. The engraving was done by ‘Engrave It!’ In Courtenay by Brandon. Like what you see? 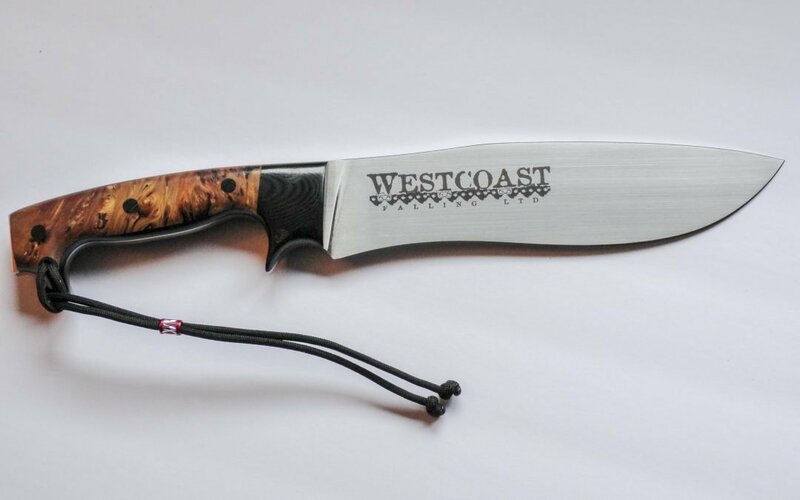 Check out some of our other beautiful custom knives. All Sandstorm Custom Knives come with the Sandstorm Promise of free lifetime warranty and free lifetime sharpening. And all Survival Knives also come with a perfectly-fitting hand sewn leather sheath at no extra charge. Order early – it takes time to create your custom knife. Contact us for a price quote. Life is too short to carry an ugly knife! Make sure yours is a cut above the rest.